Miami, FL, April 8, 2019 – Interval International, a prominent worldwide provider of vacation services, added Sunrise Suites by Lifestyle, a mixed-use all-inclusive resort in Puerto Plata, Dominican Republic, to its vacation exchange network. Located on the northeast coast, the Puerto Plata area is a highly sought-after vacation destination, renowned for its stunning beaches, coral reefs, and waterfalls. 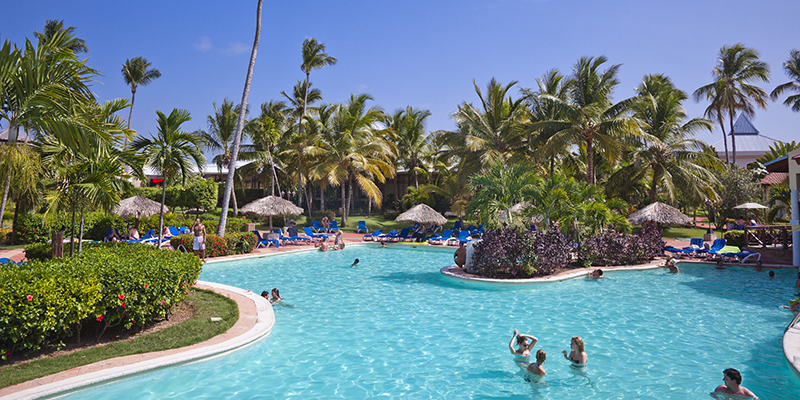 The property is part of the Lifestyle Holidays Vacation Resort complex set in lush, tropical gardens on Cofresí Beach. The four-story building features one- and two-bedroom suites that include an open-plan layout, a sophisticated design with clean lines, a neutral palette complemented by colorful modern art, and scenic mountain and ocean views. Members and guests have access to a host of amenities and services within the complex, including more than 10 a-la-carte restaurants, two buffet-style restaurants, 15 bars, bar waiting service at the beach, live entertainment, first-class spa and wellness center, outdoor swimming pools, marina, tennis courts, and much more. The resort is conveniently located in proximity to entertainment venues and other attractions in the area, such as the lively Malecon boardwalk and historic colonial district in Puerto Plata, Ocean World Marine Park, Fort San Felipe, and Isabel de Torres mountain. Surfing, sailing, kayaking, deep-sea fishing, horse-back riding, golf, and ziplining are also available near the property. New purchasers at Lifestyle Holidays Vacation Club will be enrolled as individual members of Interval International and also become Interval Gold® members, entitling them to many flexible exchange opportunities and upgraded benefits and services. These include Interval Options®, the ability to exchange their resort week toward a cruise, hotel, tour, golf, or spa vacation, or a unique Interval Experiences adventure; ShortStay Exchange®; Golf Connection, for access to select private courses; VIP treatment with Dining Connection; City Guides, for insider advice; Hertz Gold Plus Rewards® membership; savings on Getaway vacation rentals; online hotel discounts; additional special offers at restaurants, and retail locations worldwide; and VIP ConciergeSM, for personal assistance, 24/7.